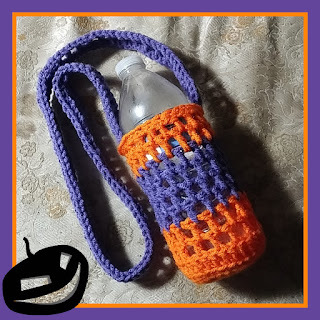 To go along with my 4th Flops, I made a quick water bottle carrier. 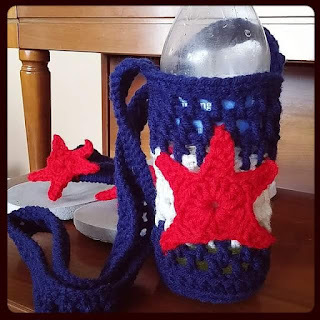 This skip-stitch design was fast and easy. We all know how it is - go to a get together, sit down your drink, and forget where we put it! I started with the following YouTube tutorial, but had difficulty getting the entire video to load (internet brain fart), so I followed it to the second round of skip stitches. From there I did six more rounds (8 total) skip stitches and topped it off with a round of single crochet. The strap is just a row of single crochet, a row of skip stitch and another row of single crochet. Be sure to attach it securely with your blunt sewing needle! 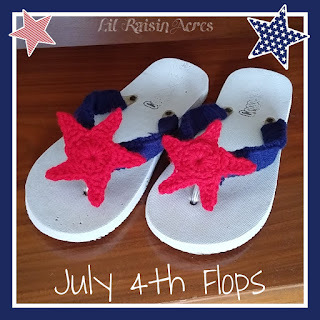 Here's a fun and easy way to dress up a pair of flip flops for Independence Day! Once you have crocheted around the straps and created your appliques, secure your stars to the flip flops by sewing through the back of the star and completely around the strap several times in the middle and on the horizontal points. Be sure to secure firmly! It seems like there's been one setback after another regarding the garden this year! The weather, the disc we bought didn't work well, Brian had to go out of town, and newborn goats the week of planting etc. So, I decided to fit what I can in where there is exposed soil around the grounds! 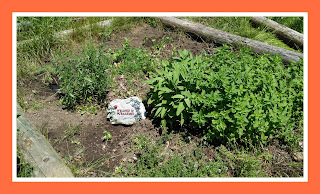 First, I had some herbs I needed to put out, so I planted the basil and rosemary in the kitchen garden in the side yard. I also had a little room in the back to place a cherry tomato and a cayenne pepper plant. 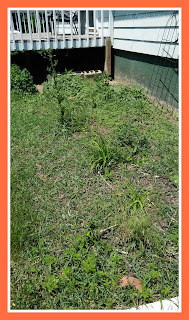 It's not much to look at (needs a good perimeter weed whacking...), but I'm already harvesting oregano, sage and thyme! I let dill, cilantro and parsley go to seed every season, got some of those coming up too! I have said before that we lack quite a bit in landscaping, and currently only have a few daylilies growing in the front bed, so I intend to go ahead and put a few tomatoes, peppers, bush beans and cukes in there this year. I have a trellis that'll work great for the cukes. Perhaps I'll throw in some sunflowers, too. I started working on it this morning, but as you can see below, it'll be a few days worth of work assuming the weather cooperates. 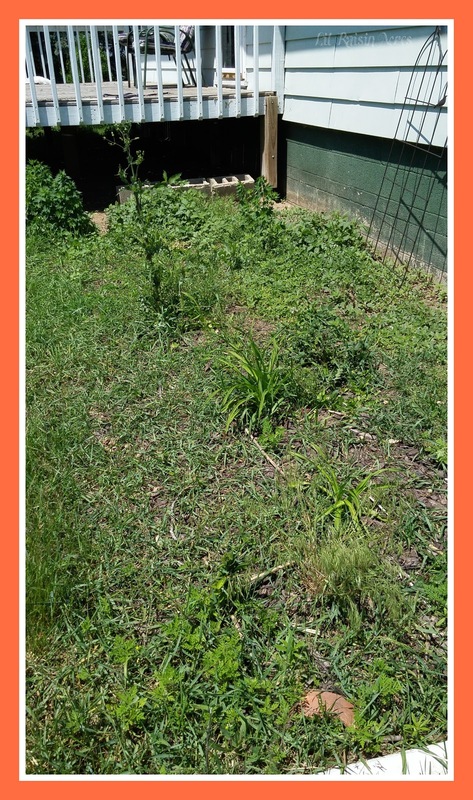 I pulled weeds til it got to 82°, then gave up! Well, I'm just sweating it out under the shade tree out back here with my phone and bluetooth keyboard, hope everyone is their day! Well, here we are, the first day of June! This morning, the furnace kicked on, and I did chores in a winter jacket.......... Last week, we were in the mid-80s sweating it out! 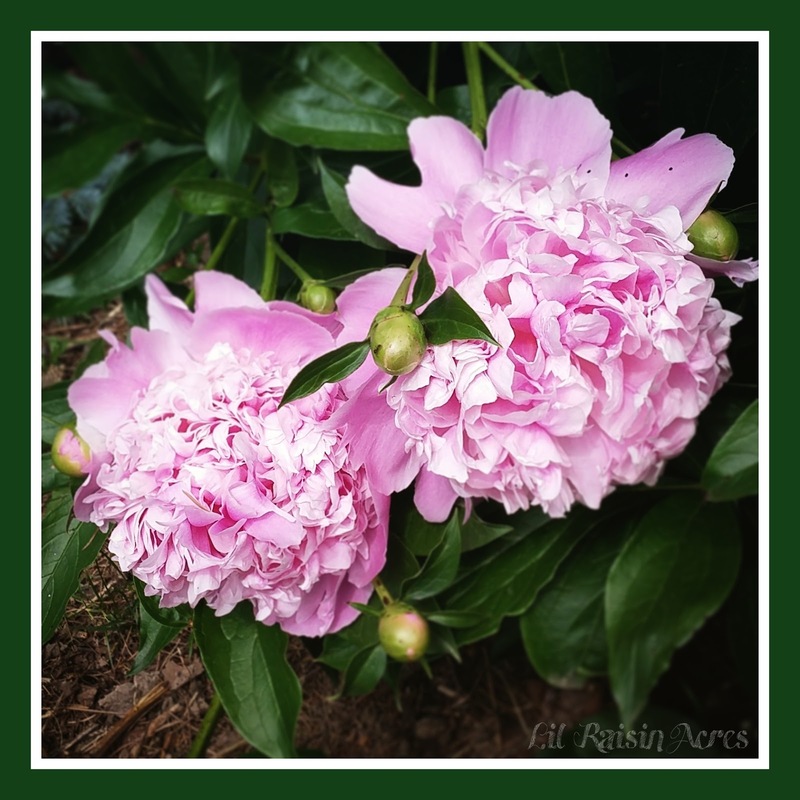 We also had a steady 18 hours of downpours Saturday eve into Sunday which pummelled my peonies and flooded out fields from here to Toledo. Almost seems unnatural, this bipolar weather. You may have noticed my Instagram activity has resumed. I am writing from my new LG G Flex2! I LOVE it! We decided to switch cell providers, saving us about $140/mo AND giving us unlimited data rather than being capped at 100gb/mo! (We like YouTube A LOT! LOL) Our signal is weak inside the house, so we plan to install an antenna/amplifier combo. Our baby goats are doing very well! Delilah has gained weight and is much more healthy looking. Samson was wethered Friday eve, he took it like a champ, and has resumed the work of his late Uncle Deenis (pestering people...). I don't even want to discuss the garden... Setback after setback. Well, it has at least been mowed back and is ready for the tiller. The seedlings I started back in March are looking sad and need to be put in the ground ASAP. Sure, we can get great produce prices at Madison Farmer's market (no shipping costs!) 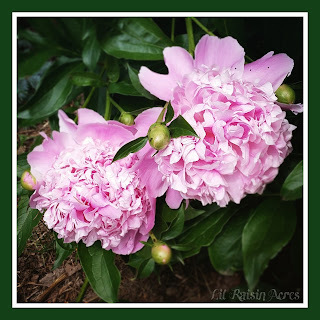 on varieties that do poorly, but still, it's the principle. We've actually really been talking a lot about installing raised beds. My dad has excellent success with his. It's just amassing all those boards! Nothing much else to report. Our 2015 hens and Rusty the Accidental Rooster are just about the same size as the '13 and '14 crew. Should start laying in about 6 weeks or so!